Yesterday (3 July) marked International Bag Free Day, but most of the world continues to use light-weight plastic bags, deemed the most harmful to the environment. A lightweight and hygienic way of moving goods, plastic bags have seen their use skyrocket in recent decades. The European Commission estimates that the average EU citizen now uses about 200 plastic bags every year. Some 90% of these are estimated to be lightweight plastic bags, defined as those having a thickness of below 50 microns, which are tossed aside and break apart more easily, wreaking havoc on wildlife. The impact is particulary high on ocean biodiversity. Turtles and ocean birds frequently ingest pieces of plastic discarded as waste, leading to suffocation. A report by the UN Environment Program estimates that about 50% to 80% of sea turtles found dead are known to have digested debris, such as material from plastic bags. Politicians and celebrities have been outspoken about the ecological cost of plastic bags, including Joachim Steiner, the head of the UN Environment Program, British actor Jeremy Irons and Catalan MEP Raül Romeva i Rueda. Steiner said, in a strongly worded statement, that there was “zero justification for manufacturing them anymore, anywhere”. 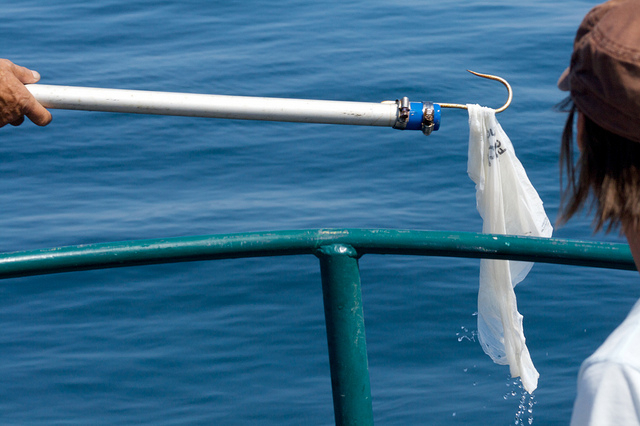 Plastic bags made up about 40% of all the marine litter across UK waters and the North Sea, according to data from the UK department for environment and rural affairs. Over 90% of waste items found on the seabed of the Bay of Biscay were plastic, according to a 2009 study by the Oslo Paris Convention for Protection of the Marine Environment of the North-East Atlantic. The environmental NGO Greenpeace estimates that plastic bags are used for an average of 20 minutes before being discarded. A handful of countries have issued total bans on light weight plastic bags, including China, South Africa and Macedonia. Italy has banned non-biodegradable plastic bags. A number of other countries have imposed taxes and levies on the sale of bags. EU ministers are currently mulling over a proposal by the Commission and European Parliament to begin a phase out lightweight plastic bags. The proposed targets include a 50% reduction by 2017 and at least 80% by 2019. The European Commission released the proposals to curb the use of thin plastic bags in November 2013, arguing that they cause more damage to the environment than other forms of carrier bag. An estimated 8 billion plastic bags end up as litter in Europe every year. In Denmark and Finland, the yearly average consumption of thin plastic bags is only four per person, compared to 466 in Poland, Portugal and Slovakia.